“Can we go outside and play?” The question is a cry from children and cubicle workers, an expression of love for natural sunlight, for nature, for purity. The outdoors is freer, less constrained. In this spirit, the Belarus trio Port Mone chose to record their latest album in a forest. 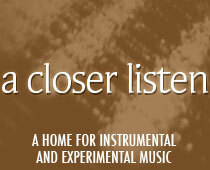 The resulting sound is loose and enchanting, a reflection of green and tan leaves. Accordion, percussion and bass may be an unusual setup for Western listeners, but is familiar to Eastern Europeans, who happily embraced the trio’s 2009 album DiP. The traditional Belarus folk thread stays intact, but Thou is also a thoroughly modern work. The album sounds like the product of its environment, while offering something new ~ a rare feat in instrumental music, which all too often comes across as region-free. Chamber music has always been popular in Minsk, but post-rock threads have seldom been woven in, as they are here. We can’t overstate the importance of the accordion, which bears the weight of the provincial tone; it’s as integral to the band’s sound as Jagger’s voice is to the Stones. The album comes across as free-form throughout, but is more structured in its earlier tracks. Halfway through “Port”, the drummer starts messing with the tempo, and it becomes clear that the set is partially improvised. How could one not respond to the trees and breeze? The percussion grows even more angled on “The words” as time signatures begin to morph. Listening to the album all the way through imitates a walk into an unknown forest; some familiar guideposts remain, but encounters grow stranger and stranger. Follow the hare, and it may lead to a wisent. “The words” may be wordless, but it contains mysterious field recordings that sound like crackle and burn: danger on the periphery. Then somebody starts hammering on “Liturgy”. Even the witch in “Hansel and Gretel” needed a carpenter. The hammer is later revealed as a drum, but the sense of foreboding continues, especially when the pace slows. What happens when the man in the forest stops what he’s doing?